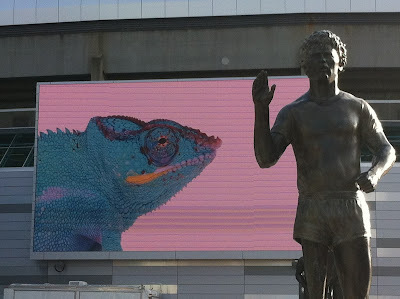 In response to a Freedom of Information request submitted by citizen’s group ‘Take the Giant Screen Down Now’, BC PavCo has reluctantly but officially admitted that the giant video screen at Terry Fox Plaza does not belong to PavCo at all, but rather to a third party. 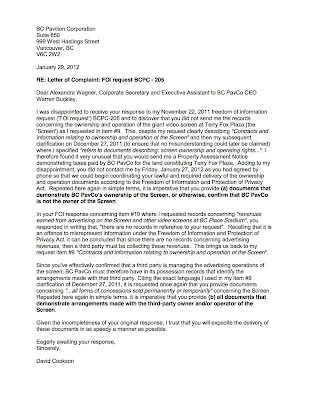 In a letter sent January 24, 2012 by PavCo administrator Alexandra Wagner, the PavCo CEO’s assistant confirms that “With respect to <revenues earned from advertising on all three giant outdoor screens> there are no records in reference to your request”, which confirms what has been suspected for months now: that a third party is collecting those advertising revenues instead. 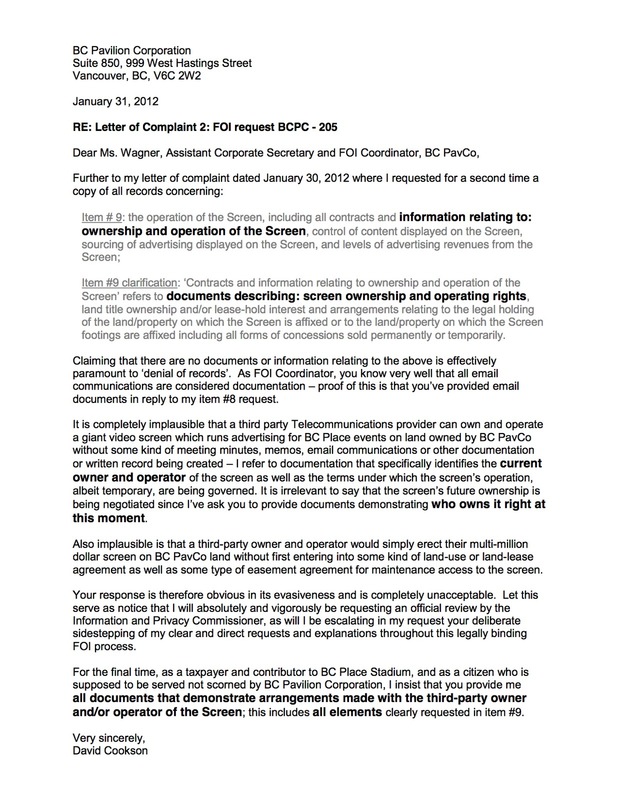 Effectively narrowing down the screen owner’s identity to either PavCo or Telus Corporation, Wagner writes in her follow-up letter sent January 30, 2012 that “Ownership of the Screen at Terry Fox Plaza is part of the ongoing negotiations between PavCo and its preferred Telecommunications partner”, suggesting that the future ownership share of the screen between these two parties is currently under deliberation. Wagner does go on to admit however that “at present PavCo has no records related to the <screen ownership> portion of your request”, which finally confirms conclusively that PavCo is not the current owner of the screen, suggesting de facto that Telus must be. 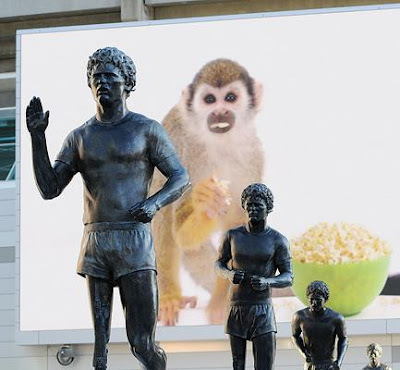 This admission further bolsters widespread beliefs that Telus Corporation is in fact the owner of all three giant outdoor screens at BC Place Stadium, a development first announced by MLA Spencer Chandra Herbert after being told so by PavCo Deputy Minister Dana Hayden in December of 2011. 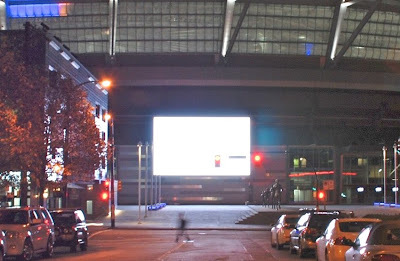 As noted in previous blogs, non-Crown-agency third-party ownership and operation of the giant outdoor video screens at BC Place is illegal under a 2000-2003 BC Court of Appeals judgement concerning the BC Interpretation Act. It now remains to be seen how swiftly Vancouver’s City Council and Legal Department will use the courts to force Telus and PavCo to comply with the City’s Sign By-laws and ultimately whip PavCo’s leadership into behaving as they should have in the first place. 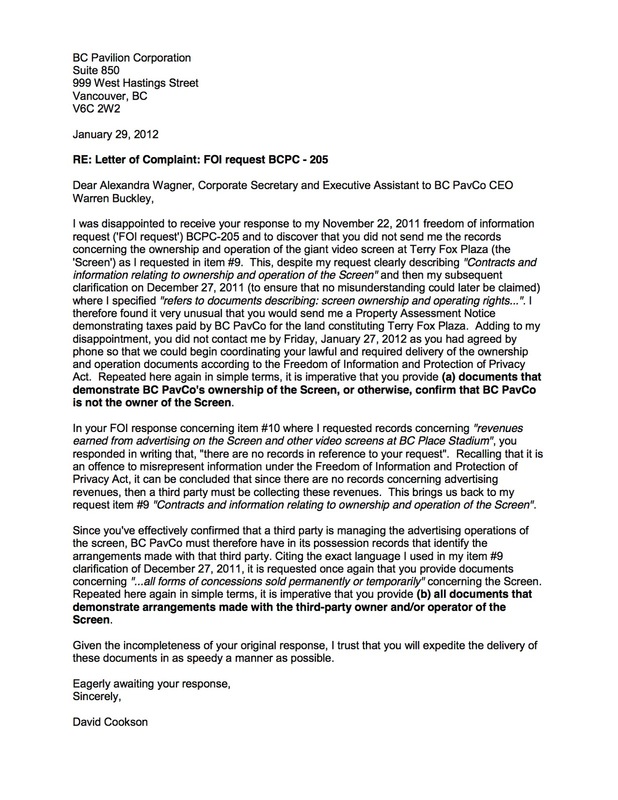 The following two letters of complaint were sent January 29 and 31, 2012 to BC PavCo’s Freedom of Information Coordinator Alexandra Wagner (who is notably also the direct executive assistant and corporate secretary to PavCo CEO Warren Buckley). The letters which address PavCo’s incomplete FOI response describe on-going attempts by the PavCo leadership to continue withholding the screen owner’s identity as well as documentation describing PavCo’s complicity in the screen’s continued operation - this despite Freedom of Information laws requiring that PavCo disclose all related documentation. Observers can rest assured that those leadership and non-leadership members of the BC PavCo administration who are deliberately allowing justice to be obstructed through wilful non-disclosure of the screen owner’s identity will legally and financially be held accountable under laws such as the province’s Tort and Nuisance laws, just to name a few. The hole is growing deeper – time to come clean. This article in the Globe and Mail tells how the three giant video screens at BC Place have sparked hundreds of emails and letters since last fall from downtown residents who properly assert that light from the flashing, beer-advertising sign has invaded their living rooms by day and their sleep by night. The story goes on to explain that BC PavCo’s recent tinkering with the screens demonstrates that they’re not at all listening to residents’ concerns. Concerned and directly affected citizens alike have been rallying for four months for the standard application of due process and have demanded that BC PavCo be made to comply with the city’s sign by-laws, laws which were precisely designed and have been successful at achieving the proper balance regarding appropriate signage throughout so-called ‘entertainment districts’ in the Vancouver downtown core. Finally, the story reminds readers that CBC (recalling that CBC is a Federal government entity, a level of government superior to the Provincial government), when seeking to erect a screen at CBC Plaza at 700 Hamilton Street in 2008, followed the standard billboard permit application process as do all Crown corporations when looking to implement projects which are generally described and governed by Vancouver’s city by-laws. 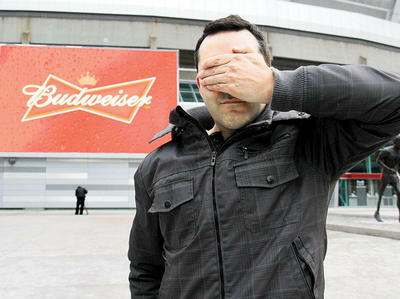 – Feeling the pressure mounting, PavCo CEO Warren Buckley has chosen to run and hide and has left BC Place assistant general manager Kathy Delisser all alone to make outlandish statements, such as trying to shrug-off responsibility by saying that BC Place isn’t free to do exactly what it wants with the sign due to ongoing sponsorship negotiations. …It’s becoming increasingly obvious to even the least interested onlooker that PavCo’s actions regarding the three screens at BC Place Stadium are marred with irregularities and that the erecting of the three screens is a complete deviation from any and all accepted procedures considered appropriate by all levels of civic and provincial government. 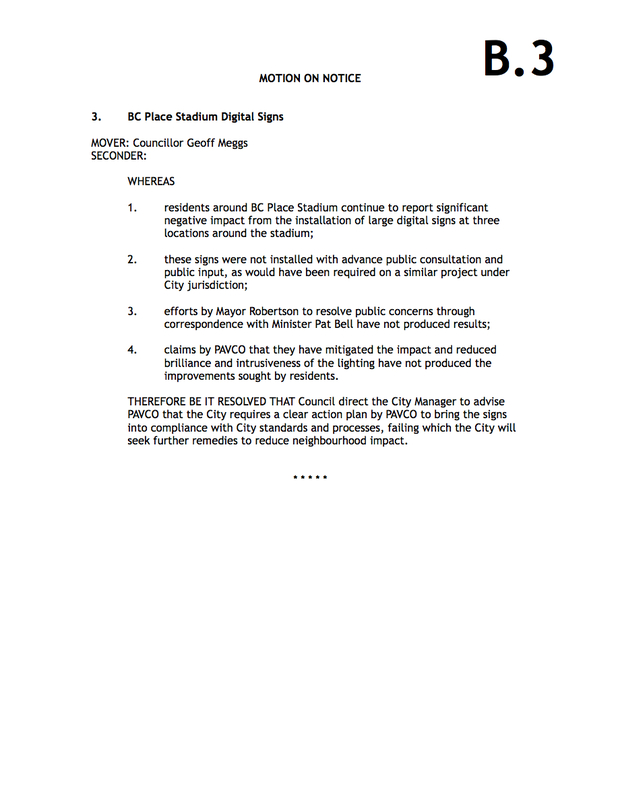 In this story appearing in the Georgia Straight, Vision Vancouver councillor Geoff Meggs describes the unanimous motion passed by Vancouver City Council concerning the giant digital billboards at BC Place Stadium and describes how the City is requesting that PavCo follow standard protocols which are typically followed by Crown Corporations, “This motion asks PavCo to do what Crown corporations have said in the past they would do...that they would adhere to city policies and procedures when it came to issues that would normally be under our jurisdiction”. – It seems that PavCo CEO Warren Buckley’s appalling lack of community values and shameful actions are not only trouncing on local city residents’ right to a peaceful home environment, but now Buckley is also putting into jeopardy BC PavCo’s long-term relationship with the City of Vancouver. …Not exactly qualities you’d want from the head of one of our provincial organisations, nor someone you’d want empowered to make such big decisions about the shape and character of our City. “There’s no reason why a small group of revenue-hungry elitist executives in a dark room somewhere can decide what type of harassment that they’re going to impose on our community,” says residents group Take the Giant Screen Down Now primary spokesperson David Cookson about the BC PavCo leadership. – Vancouver City Council agrees. Councillor Meggs goes on to explain about agreements made between PavCo and the City prior to the stadium renovations, “They promised when they applied for rezoning in the first place they would come forward to the city the way anybody else would under the circumstances.” Crown corporations traditionally respect municipal bylaws, but PavCo erected the screens without city approval. In this story by Metro reporter Matt Kieltyka, members of Take the Giant Screen Down Now (TtGSDN) and the community alike applaud Councillor Meggs for standing up for local residents quality of life and well-being. City Councillor Meggs states that “On an overcast day, it’s quite disturbing having a light flashing in your living room”. — 'Disturbing' is an understatement; community residents need rest when they’re at home, not bombardment with advertising all day every day. Surprisingly, the MLA For Vancouver-False Creek Mary McNeil remains conspicuously quiet on the issue and has abandoned the Councillor to defend this community on his own, which is disappointing to say the least since this is McNeil’s constituency. TtGSDN primary spokesperson David Cookson confirms not hearing back from McNeil despite repeated requests for contact by phone and by email on many occasions. Is MLA McNeil toeing the partisan line and simply refusing to listen to her electorate in the hopes that this will go away? In this follow-up story by CTV BC News, MLA Spencer Chandra Herbert confirms that PavCo Deputy Minister Dana Hayden admitted Telus Corporation’s ownership of the Terry Fox Plaza screen. When contacting Telus to confirm ‘who owns the screens’, Telus is exposed by CTV reporter Shannon Paterson as inappropriately ducking the question and deferring to sponsorship issues. – Similarly for PavCo. Interestingly, jurisprudence in the BC Appeals Court decision ‘District of Squamish v. Great Pacific Pumice’ indicates that City By-laws are applicable, therefore providing the City with the authority to remove third-party-owned screens from Provincial land if they do not comply with City By-laws. 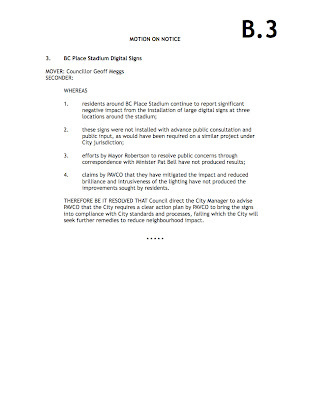 The following CTV News story confirms the flood of complaints reaching City Hall over the last four months regarding the intolerable nuisance caused by the three giant video screens at BC Place Stadium. Also covered in the story is the increasingly likely prospect of Telus Corporation actually owning and operating the three screens in secrecy. Seeking desperately to flee from this public relations disaster, both PavCo CEO Warren Buckley and Telus spokesperson Shawn Hall have frantically resorted to the age-old damage mitigation tactic of stonewalling the press by refusing to comment on the Telus ownership issue. Increasingly, it’s not just the ownership of the giant screens of that’s being put in question, but also the leadership of the BC Pavilion Corporation. 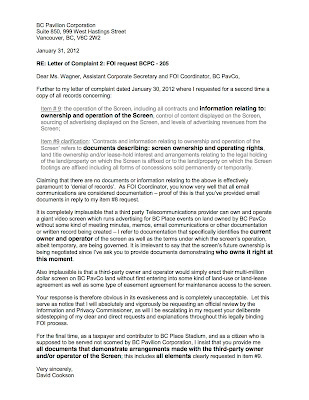 Investigative journalist Bob Mackin of the Vancouver Courier publishes an incredible admission from the PavCo Ministry stating that the three giant video screens at BC Place Stadium are privately owned by Telus Corporation and not at all owned by BC PavCo as CEO Warren Buckley has been intimating to City Hall and to Vancouver City residents! “Crown corporations usually consult with the City” says Councillor – Why not PavCo? Provincial and Federal agencies, as a matter of protocol and of respect for civic authority, always follow city by-laws voluntarily - Such has always been the case, as it has been completely unthinkable that the Crown would act in a way so obviously detrimental to the well-being of the local community. PavCo has the honourable distinction of showing us otherwise. A Vancouver City Councillor is trying to address the complaints he says are still coming in about the bright lights around BC Place. It's been more than three months since people living near the newly renovated stadium started complaining that its billboards were keeping them up at night. Geoff Meggs says that issue hasn't gone away and Pavco's efforts haven't been enough. So, he plans to table a motion next week to ask the stadium operator to bring the signs up to standard, "Go back, use the best match you can work out for what should have happened in terms of public consultation and go through a process with people, because it's not working the way it is." Meggs says the city was taken by surprise when the signs were installed without consultation, as he says Crown corporations usually do. ‘City Hall Watch’, a citizen review website addressing major City of Vancouver policies, chronicles the 2008 decision by the BC Supreme Court and BC Court of Appeals to have a giant billboard at Main and Broadway removed as per the City of Vancouver’s wishes. The story goes on to explain that “At the time, the City of Vancouver had assembled an entire legal team to fight the billboard in Mount Pleasant”, and that now, the author adds, “the city has experience and <has set> a precedent in fighting illegal billboards.” - Will City Hall once again mount a determined charge against, this time a high intensity electronic billboard, and force the dismantling of the Terry Fox Plaza giant screen? Indications coming from City Hall are very promising… stay tuned for developments.